This is a juicy, tender slow cooker pork roast with a sweet and lightly spiced brown sugar and cinnamon glaze. Serve this easy pork roast with mashed potatoes or baked potatoes, along with steamed broccoli or your favorite side dish vegetables. If you cook a large pork loin, you'll probably have leftovers. It makes excellent sandwiches with a little barbecue sauce or mayonnaise. This Pork and Spaghetti Casserole and Easy Leftover Pork and Potato Casserole are good choices for leftover pork roast. If the pork has an excessive layer of fat, trim it a bit. A little fat will help keep the roast juicy over the long period of cooking. Rub the roast all over with the garlic halves, then sprinkle with salt and pepper, then prick the roast all over with a fork or skewer. In a cup or bowl, combine 1 cup of the brown sugar, the mustard, and vinegar. Rub all over the roast. Cover and cook on LOW for 7 to 9 hours, or until tender but not falling apart. Pour off the excess juices. Combine the remaining 1/3 cup brown sugar with cinnamon; Spread the mixture over the top of the roast. Cover and continue cooking on LOW for 1 hour longer. Serves 6 to 8 with leftovers. One serving of meat or poultry is generally 3 ounces. 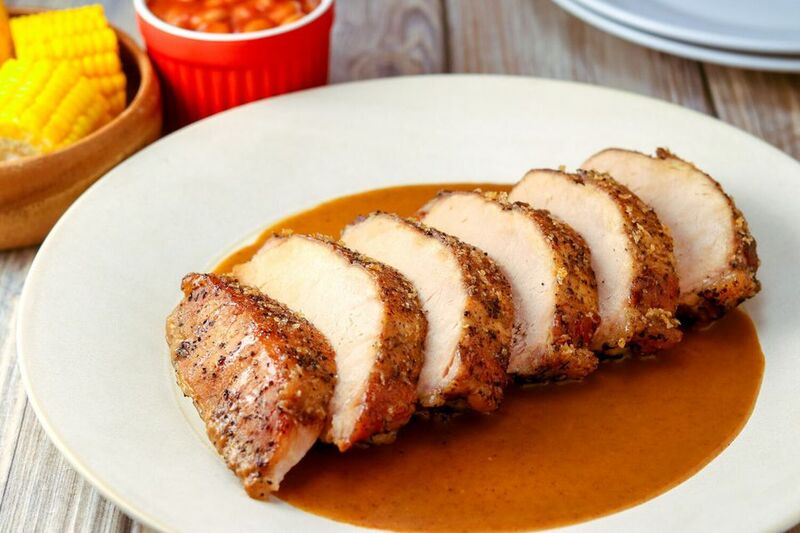 Each pound of pork loin uncooked will yield approximately 12 ounces cooked. According to the USDA, pork must be cooked to a temperature of at least 145 F.
If the roast is very lean with little or no visible fat, top it or wrap it with 4 to 6 strips of bacon.